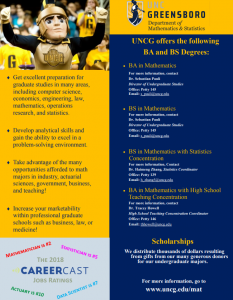 The Department of Mathematics and Statistics offers undergraduate programs leading to the BA with concentrations in mathematics and high school teaching licensure and the BS with concentrations in mathematics and statistics. The BA program is more flexible than the BS program. It allows one to specialize in mathematics and at the same time either to follow a broad liberal arts program or to specialize in a second area (possibly even taking a second major). The BS program is more technically oriented; it provides solid preparation for work or study in mathematics or a related field. Students wanting to go to graduate school are encouraged to consider the BS degree or the new Accelerated Degree Program (ADP) to earn a BS and MA in 5 years. Strong students can graduate with Disciplinary Honors. We also offer minors in mathematics and statistics. Mathematics is an excellent major for the student whose immediate objective is to acquire a strong liberal arts education. The goal of all of the Department’s programs is to produce students who are both technically competent and sufficiently well grounded in theory that they can contribute to fundamental research in their chosen specialty. There are many opportunities for the undergraduate majors in the mathematics in industry, government, business, and secondary school teaching. Graduates may go on to work as an actuary with insurance companies; as a data analyst with pharmaceutical, biotechnology, or health care companies; as a quality assurance specialist with engineering companies; or in government agencies such as FDA, EPA or USDA where their main responsibility is to check compliance for quality specifications. An undergraduate major in the mathematics also provides excellent preparation for graduate studies in many areas, including actuarial sciences, computer science, economics, engineering, law, mathematics, operations research, and statistics. The major can be specialized to allow preparation for any of these goals. See our Tracks page for some suggested coursework to begin down some of these paths and our Sample Schedules to see how these fit together with the overall plan of study. The Undergraduate Bulletin should be consulted for detailed requirements, including the allowable electives. We outline the MAT/STA requirements here. The degree also requires 122 semester hours, to include at least 36 hours at or above the 300 course level or above. See our Courses page for a brief description of the courses. See our Degree Requirements Details page for additional details about the requirements. Apply during your junior year, and earn up to 12 hours credit toward a MA degree while you earn your BS. See our Accelerated Degree Program (ADP) page for details. One year sequence with labs in Physics with Calculus, Chemistry, or Biology.